Explanation: Well over a thousand galaxies are known members of the Virgo Cluster, the closest large cluster of galaxies to our own local group. 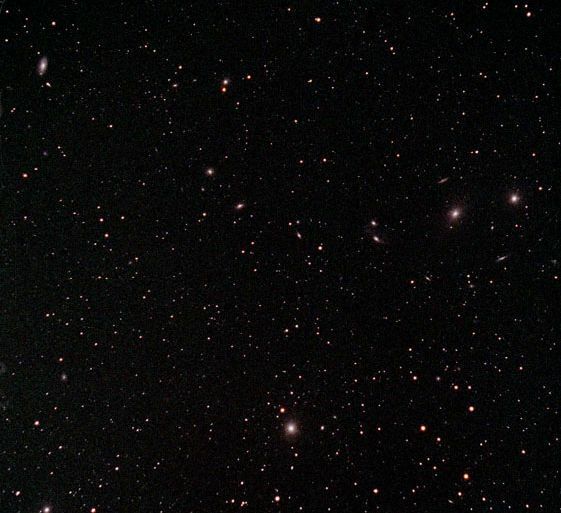 The galaxy cluster is difficult to see all at once because it covers such a large area on the sky. Still, this excellent telescopic view records the region of the Virgo Cluster around its dominant giant elliptical galaxy M87. M87 can be seen as a fuzzy patch near the picture's bottom center. 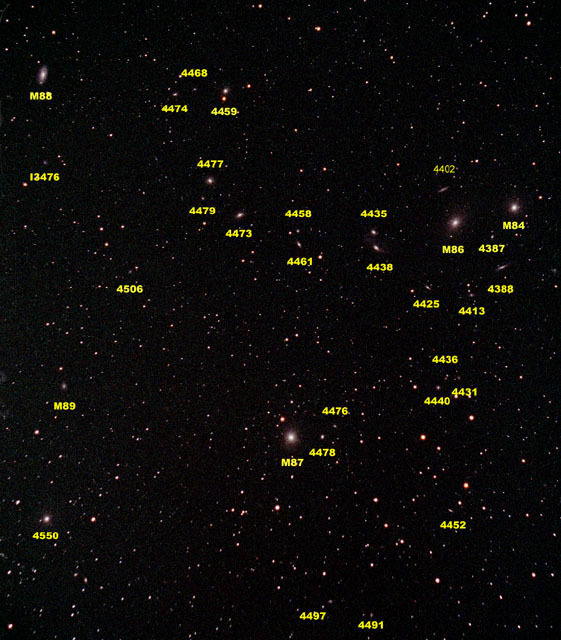 In fact, a close examination of the image will reveal that many of the "stars" are actually surrounded by a telltale fuzz, indicating that they are Virgo Cluster galaxies. How many galaxies can you pick out? Click on the image for an uncropped, labeled version which includes the NGC catalog numbers for most of the visible galaxies. On average, Virgo Cluster galaxies are measured to be about 48 million light-years away. The Virgo Cluster distance has been used to give an important determination of the Hubble Constant and the scale of the Universe.